Letter from John G. Kirkwood to LP RE: Mentions LP's upcoming visit to New Haven. Goes on to discuss his plans for his own upcoming lectures in France. [Letter from LP to Prof. Kirkwood February 17, 1953, following letter from Prof. Kirkwood to LP May 29, 1953] [Filed under LP Correspondence: Box #198, Folder #12 (Kirkwood, John G.)]. 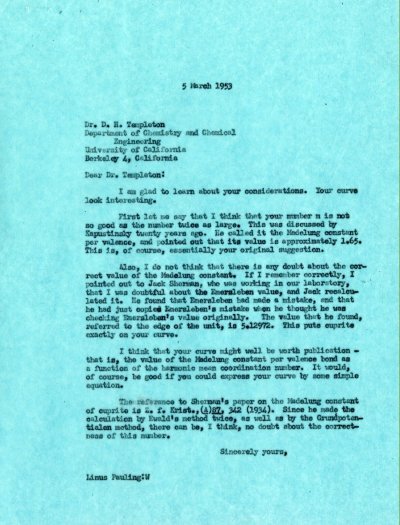 Letter from Peter Pauling to LP. [Filed under LP Biographical: Box 5.041, Folder 41.7]. Thank you very much for your letter which came today. I was most pleased to get it, as I had begun to wonder what you were doing and how you are. I am rather interested in contacting Linus and would appreciate your advising me where he is if he is not at home in Honolulu. It is not terribly important. I like Anita very much too. I think she is a wonderful person. I have not heard of nor seen Peter. He still has his flat in Paris. I got on to the Penguin people, and they will be coming, tell Daddy. I have been getting them in quantity. Their classic translations are poor, I think. They get a little dull after a while. I am going mad in this cramped room I have. I must move sometime to more. I must make a bookshelf & a wardrobe. It is just terribly cramped. Are foam rubber mattresses good? New prices full depth, double bed $66, single bed $45. I might get a little one. It is stupid to be uncomfortable all the time. I am now calculating. Finished a hard three weeks of experiments. Been going to London. Music. Girl. Never lose my head very much any more.